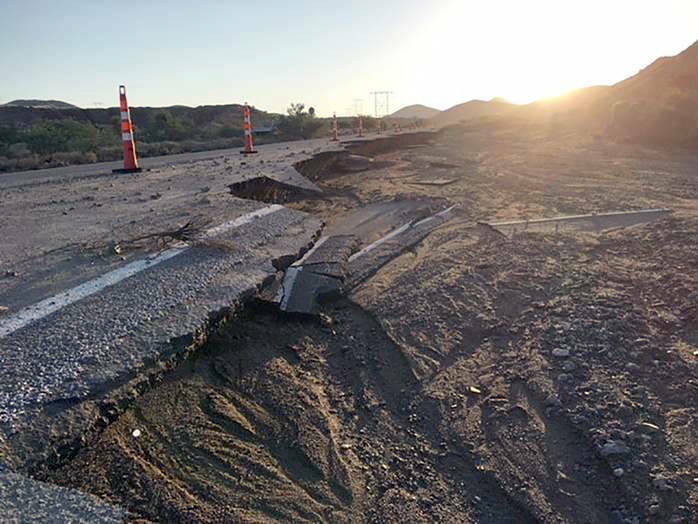 Nevada Department of Transportation Flood waters damaged Nipton Road Repairs are underway to fix a portion of Nipton Road (State Route 164), which closed Aug. 15 following flash flooding. A man died while swimming at Lake Mead on Sunday, Sept. 1. Filiberto Figueroa, 49, died as a result of an accidental drowning, according to the Clark County coroner’s office. At 4:40 p.m., the Lake Mead Interagency Communication Center received a call reporting that a man didn’t surface while swimming in open water near Sand Island. His body was recovered Sunday, Sept. 2. The 39-year-old driver of a BMW that crashed into the back of a Honda Prelude parked on the right shoulder of Interstate 11 on Aug. 28, killing two people, remains in custody at Clark County Detention Center. Antonio Romualdo-Macedo is being held without bail on counts of DUI resulting in death and substantial bodily harm, child abuse or neglect and failure to maintain a lane. Troopers believe Romualdo-Macedo, who’s from New Mexico, was impaired and speeding, the highway patrol said. A 4-year-old child was in a car seat in the back seat of the BMW at the time of the crash, officers said. Officials have identified the victims as Henderson resident Jennifer Rene Taylor-Beasinger, 49, who was driving, and Julius Milton Blankenship, 43. A passenger in their car was hospitalized with survivable injuries, as was the child in Romualdo-Macedo’s sedan. Charles Cuvelier, deputy superintendent at Lake Mead National Recreation Area, is acting as superintendent of the 1.5 million-acre park until later this month, when the acting superintendent arrives. Martha Lee from the Park Service’s regional office will hold the top position until a permanent replacement is found for Lizette Richardson, who retired Aug. 31. Lee is expected to arrive Sept. 17, according to Christie Vanover, spokeswoman for Lake Mead. According to Vanover, the length of Lee’s stay at the park is unknown. No details on when a new superintendent will be named were available. The Nevada Department of Transportation awarded a $3.45 million emergency contract to Las Vegas Paving to repair Nipton Road (State Route 164), which closed Aug. 15 following flash flooding. A storm washed away portions of the east-west highway between mile markers 2 and 6. The two-lane, 18.6-mile road connects U.S. Highway 95 in southern Clark County near Searchlight to Nipton, California. The improvement project, which began Tuesday, Sept. 4, calls for placing new roadbed, asphalt paving and installing new precast concrete box culvert for enhanced storm water drainage. The road will remain closed to through traffic during construction. The Boulder City Chamber of Commerce will hold its annual installation and awards event at 6 p.m. Friday, Sept. 21, at the pavilion at Boulder Creek Golf Club, 1501 Veterans Memorial Drive. The evening’s entertainment will be a lip sync battle. Those who would like to participate must register by Monday, Sept. 10, and be available Sept. 20 for a rehearsal. A People’s Choice award will be presented, and those attending will be able to purchase a vote for $5 each. Tickets for the event are $55 per person or $100 for two. They can be purchased at the chamber office, 465 Nevada Way, or at www.bouldercitychamber.com. For more information, call Kassie at 702-293-2034.